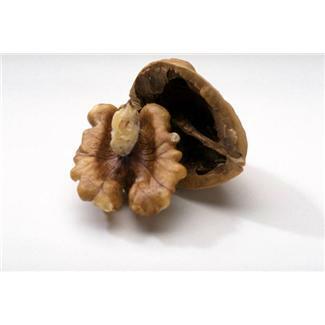 Food News – Walnuts are the healthiest nut! I’m a big fan of walnuts and add them to salads and pasta sauces, as well as making them into burgers and roasts. Eating nuts everyday, as part of a healthy diet, is known to boost health, but recent research indicates that walnuts are the healthiest, containing antioxidants up to 15 times as powerful as vitamin E. They also contain vitamin B6, protein, magnesium, potassium and zince. On top of all that, they are a useful source of omega 3 fatty acids as they contain omega 3 and 6 in the perfect ratio for human consumption! So whatever you’re having for dinner tonight, throw in a few walnuts, or try these walnut burgers! Put all the ingredients in a food processor or mixer and blend. You may have to do this in batches. Tip into a bowl and squash the mixture together. Leave the mixture to rest for 5 minutes before forming into burgers with floured hands. Cook on a hot barbeque, turning after about 5 minutes, or grill or shallow fry them in hot oil. Cakes for Japan pop-up shop Today! In a brilliant stroke of charitable inspiration, Maiden on Shoreditch High Street, London, are hosting a pop-up, sushi inspired cake shop to raise funds for the Red Cross and their work with the victims of the earthquake and tsunami in Japan. Early Vegetarian Recipes in Viva Life! Viva Life Magazine is the publication of wonderful veggie organisation Viva! run by Juliet Gellatley. I was delighted therefore to notice a picture of Early Vegetarian Recipes amongst it’s pages, accompanying an article on the writers who spearheaded the veggie recipe movement. The book is pictured right next to Rose Elliot, who regular readers may have spotted is a hero of mine! To read the article, go to page 26-27 using the device at the top of the page. We’ve been having another burst of cold weather lately, which always brings on a craving for comfort foods. A big steaming bowl of vegetable soup is about the healthiest comfort food there is (sadly beating chocolate fudge cake hands down on that score!). Celeriac is, frankly, an ugly vegetable, and you may have passed over it for that reason. But it has a lovely fresh flavour and makes a delicious soup. It’s also very satisfying to cut off all the rough bits and end up with a smooth, white, celery-scented root! 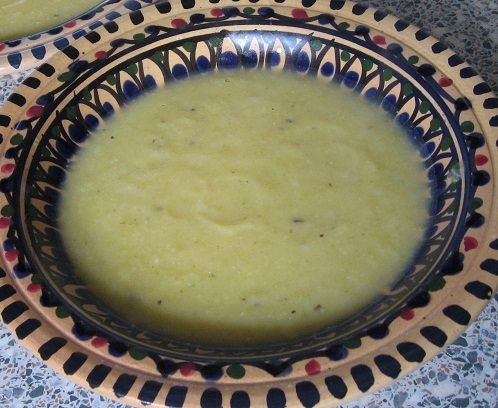 It’s nutritionally useful as it contains potassium and vitamin B6, as well as vitamin C. A little cream, mascarpone or grated cheese stirred in at the end really enriches this soup if you’re looking for an extra indulgence, but it’s also perfect as it is! Heat the butter or margarine in a pan and add the onion, celery and ginger. Stir to coat and cook gently for about 5 minutes. Add the remaining vegetables, stir and cook for another 5 – 7 minutes. Add the stock and the bay leaves, bring the liquid to the boil, then reduce heat to a simmer. Cook the soup for about 20 minutes until all the vegetables are soft and the potato starting to break down into the water. It is then best to blend the soup with blender or food processor until it is smooth. Reheat the soup to serve.